Welcome to Best Thing We Ate This Week, where each week, we'll have a special guest or Thrillist staff member talk about a New York dish they recently tried and loved. This week, Michael Chernow (co-owner of Meatball Shop and owner of Seamore’s) talks about his absolute favorite pizza in New York. A couple of weeks ago, I went out to Di Fara Pizza, and it’s probably just about the best pizza by the slice on the planet. I’ve had pizza from all over the world, and Di Fara pizza is truly exceptional. The place has been open since 1959, and Dom DeMarco, who’s been making the pizza for the last 50 years, has a truly magical way of making it. I grew up in Manhattan, and I was probably in junior high school when I first had Di Fara. I took the train out there with a bunch of friends. People told us it was the best pizza on the planet, and I’ve been eating it for about 22 years since. You gotta call before you go because sometimes they just close out of nowhere. They don’t really have hours. 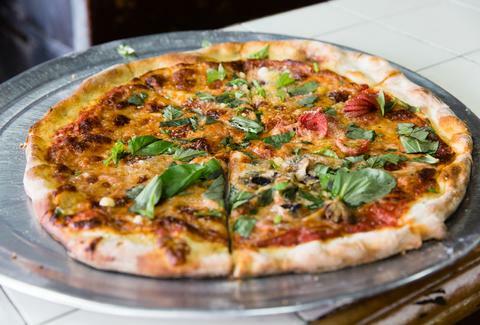 Di Fara does two pizzas: a round and a square. If you look online and you google “Di Fara: round or square,” there are battles that have been going on for decades about what’s better. The square pizza is what most people would know as a Sicilian-style slice. It’s essentially fried in the pan and very delicious, but I prefer the slice from the round pie. Crust, flavor, texture, ingredients, and tradition are the five things that make this margherita pizza amazing. I’m sure the dough recipe is super, super secret. The sauce is really sweet. I like a sweet tomato sauce, and the mozzarella cheese is spectacular. They cut the fresh basil right onto the pie as it comes out of the oven. When I think of pizza, I think of Di Fara. And when I don’t have Di Fara and I’m eating pizza, I think of Di Fara.